A regional journalist who rose from the position of apprentice to editor at two sister weeklies has died aged 79. Tributes have been paid to Bill Bradshaw, former editor at both the Cambs Times and the Wisbech Standard. Bill began his career as an apprentice on the Times in 1952, later serving as sports editor for 14 years and group features editor. 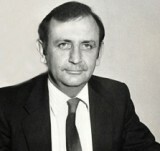 He became Times editor in 1983 following the retirement of the late Jack Hall, and also edited the Standard for four years. Following his retirement in February 1994, he continued to serve as village correspondent for Wimblington, his place of birth, where he was also clerk of the parish council. Another former editor of the sister titles, Brian Asplin, paid tribute to Bill, who had suffered dementia for some years. He said: “Bill was a solid old school journalist. He was opposed to journalistic gimmicks. His view was that if a story was news worthy the public should be told about it simply, objectively and above all accurately. “He was a great man for detail. He would never accept a defence from staff that a story was ‘almost correct’. He was a big people person, preferring to escape the comfort zone of his office to meet outside. “One of his maxims was ‘where there’s people there’s news’. The first time I met him was in 1964 when I was a trainee reporter and he was sports editor. He quickly became my mentor and subsequently a life long friend. Terry Redhead, who worked with Mr Bradshaw when he started as a junior reporter in 1972, added: “He took me under his wing and helped me flourish as a journalist. “Bill always had time for everybody, he would help reporters out with stories, give advice. He was a real old school newspaper man, he loved the Fens, wanted to get behind campaigns, support the local people. Bill lived with his wife Brenda in Wimblington, near March. They had two daughters, Sandra and Lorraine. Lorraine died of leukaemia in 2006 aged 43, but Bill is survived by five grandchildren – Vicki, William, Daniel, Lucy and Stephanie. Bill died on 23 December, and his funeral will be held tomorrow at 11.45am at St Peter’s Church, Wimblington, followed by a private cremation.